On my way to the oil spill I crossed Paris, Texas and reached Alexandria in Louisianna yesterday. In Paris I saw the Eiffel tower with the red cowboy hat. 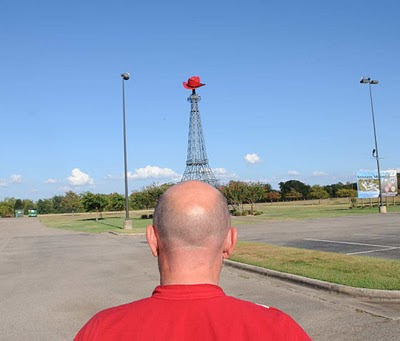 Burkhard Saur took a Photo which shows the texanian homage to Paris, France as a drill tower on top of my bald head. We started in Ada, Oklahoma after some problems with a kitchen water spill and finished our trip yersterday night in Alexandria. 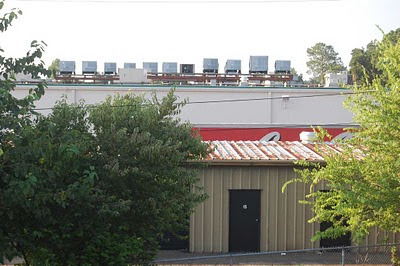 I´m afraid of the heat at the gulf coast. In the morning hours it is already unbelivably hot. The hum of the air conditioning here in Alexandria sounds like a blues song for cool global warming. This evening I will search for crude oil at gulf coast beaches.